Every year, IRCE is a different show. VL OMNI has been exhibiting at IRCE on and off since 2012, and each year we’re astounded to see the evolution of the show. Catering to the changes of the ecommerce market means changing along with it, too. And IRCE has always done this very well. 2018’s show was no exception. While the exhibition floor was more condensed than it’s been in previous years, you’d be mistaken to assume that IRCE 2018 was any less than it’s been in the past. In fact, many people we talked to — exhibitors and show attendees, alike — were astounded by the show this year. 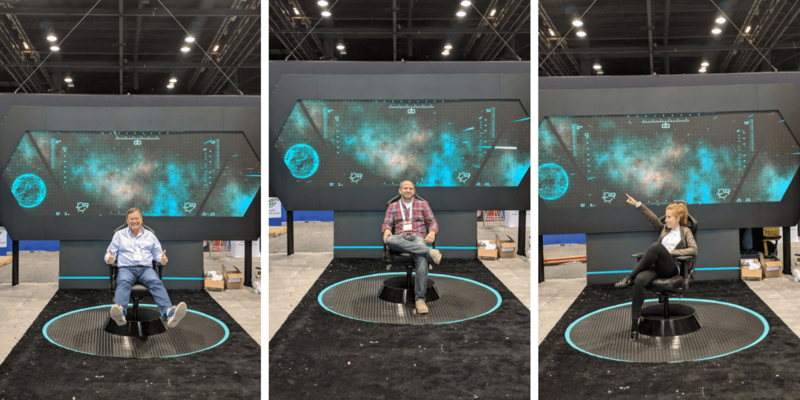 Keep reading for our full breakdown of what happened on the exhibition floor at IRCE 2018! Regardless of the actual square footage of the show, IRCE 2018 had a ton to offer all those who walked through the iconic blue arches. The vibe this year was almost electric, and you could almost feel the buzz in the air. With Chicago only just over an hour away by air, the VL OMNI team set out for McCormick Place West early Tuesday morning. Luggage in tow, we headed straight to the venue space to set up and take a quick walk through the hall to scope out partners’ set ups. Shopify Plus had once again raised the bar with their epic out-of-this-world booth. Our team popped in to say ‘hi’ to one of our favourite partners… and to sit in the captain’s chair and take a couple quick snaps before the show floor opened to the public. In recent years past, IRCE launched with an unofficial kickoff with their Day 1 Happy Hour. This exclusive preview of the exhibition floor is designed to pull IRCE conference attendees in after a long day of though leadership and learning, and in the past this has been a nice, warm way to start the show. This year’s happy hour had a completely different tone, though — and for the positive. In years past, the happy hour has felt causal, relaxed, and more on the informal side of things; VL used it to connect with our various partners before we were all too busy to take two steps outside our booths. But this year’s happy hour was full to the brim with enthusiasm from both partners and merchants, with extra emphasis on the latter. Merchants streamed onto the exhibition floor with clear targets in mind, and VL OMNI was very clearly one of those targets. This is the first year we’ve had so many great e-tailers and multichannel retailers walk — with purpose! — directly up to our booth before the show had even officially kicked off, and it set an absolutely amazing tone for what was in store for us over the following two days of the show. After the Happy Hour wrapped, it was off to one of the many parties that always happen after each day of the show. This year, VL OMNI also secured three tickets to the exclusive Shopify Plus Rooftop Party. Not only did we have a great time, but we had a chance to meet with both new and known friendly faces. Day 2 — the official opening of the exhibition floor to IRCE attendees — always kicks off with a bang. Attendees this year were chomping at the bit to get in and start into the aisles; the usual slow trickle at 9:00 AM was more of a stream, which quickly picked up to a torrent by 10:00 AM. And attendees clearly had plans and goals in mind for what they wanted to get out of the show. Maybe they saw our earlier blog post about coming to the show prepared, and took it to heart! And again, in almost a repeat of the happy hour the evening before, merchants and prospective partners alike came directly to VL OMNI’s booth. As we’ve seen this year in other shows we’ve attended and exhibited at, change is definitely in the air: it’s clear to us that merchants are becoming not only aware of data integration, but are also starting to embody the deep understanding of what data integration means to their business at strategic and tactical levels. Merchants have clearly had enough time to experience other data integration solutions out there — namely DIY and plug-and-play, but also manually moving data from application to application — and are becoming savvy that not all integration solutions are created equal. This was also the first year we literally had multiple “take my money!” conversations with merchants. Tired of inefficient solutions, undersized data integration products, and fully aware of how a back-end technology stack can either impede or augment a company’s organic growth, VL OMNI was the only data integration platform these merchants wanted to talk to. They had seen the other side of the coin, and they are more than ready for a data integration solution that performs at all levels, meets their strategic objectives, and ultimately allows them to do what all these individuals really want to do: stop managing data so they can run their business bigger, harder, and faster. Aside from the self-directed merchants with a homing beacon set on VL OMNI’s booth, Day 1 saw many of our amazing partners and fellow Shopify Plus Partners in and around the Shopify Plus booth (have you seen our telescope? Thanks Shopify Plus!) trading leads back and forth. More than once did our partners hand-deliver merchants to our space, singing our praises and making a warm introduction (and VL OMNI did the same in our partners’ directions, too!). IRCE was clearly all about the community of incredible agencies and technology partners that VL OMNI counts ourselves as fortunate to be a part of. To be surrounded by so many like-minded amazing individuals who hold to the same beliefs of great offerings with the merchants’ success at the heart of all they do is a large part of what VL OMNI does. After all, without great applications to connect or passionate agencies to help lead merchants down the right paths, VL wouldn’t be where we are today! After the show had shuttered for the day, the VL Team — Robin H. Smith, Jessica Thiele, and Wayne Thompson — hit the road and headed off for another round of hotly anticipated after parties. There were so many parties to choose from, but we decided to go to the party that always has the best turnout: the Avalara Dolls & Molls Party at Carnival was definitely the place to be! Sponsored by our friends and partners Shopify Plus and Dotmailer, and co-sponsored by other great names like Salesforce, Acumatica, and many more, it was just what the doctor ordered after a long day at IRCE for exhibitors and merchants alike. Day two of the exhibition is always a bit slower than day one for IRCE. 2018 held true to its roots, and while there was generally less foot traffic, the great conversations with merchants and partners continued at a steady pace. We also had a bit more time to visit partners’ booths and to follow up on conversations and meetings from the previous day. But, like every year, IRCE started to take a toll on the attendees. After all, all the walking, talking, and partying tends to catch up with people. By the afternoon, exhibitors were starting to allow themselves to feel the impending relief that comes hand-in-hand with the closing of IRCE each year, and when the lights finally turned off signalling the official end to IRCE 2018, there was a raucous cheer and applause from the show floor. Want to continue the conversation from IRCE, or to start a new one?